These are awesome! Too bad they never made it to production. Would love to have them. There are other colored TC/PL lamps in the market (Colored versions of the Osram Dulux S and D and Philips PL-S and PL-D, and others). Into fluorescents and HV neon since I was 14. Such a shame these never came into production. I remember walking past Tesla's Holesovice plant on a visit to Prague some years back. There were some interesting CFLs hanging in the windows of the derelict building. These were in production, till at least till 90's (when the complete Tesla Holesovice start went down), I still have few color DZ-9 (=PLS-9W), but unfortunately not working anymore. All this lamps was possible buy in better shops, moreover also in 7 and 11W size. Plus BL350. With incandescents you have no other option than use the color filter. It need separate phosphor powder for each color, so separate handling from very early stage of manufacturing, what make the logistic more expensive. 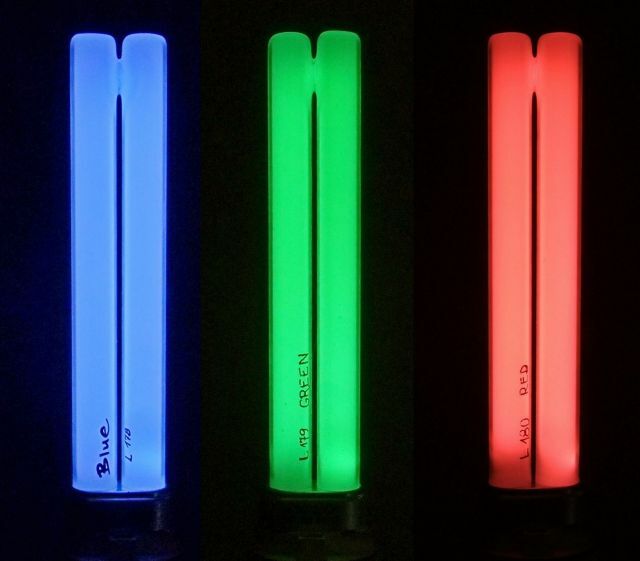 All the phosphors, their suspension, coated tubes till finished lamps (that is most important, as it influence the all post-manufacture handling till final installation) are of white color, so very prone to accidental mix up, so the quality problems. So it become way cheaper to just make an ordinary white lamp and coat it with filter gel. The separation even from the regular white production happen on quite late stage in the process, so before the gel is applied the lamps do not differ, so there is nothing to mix up, and after the gel application it become directly visible, what color it is, so easy to spot a wrong lamp at wrong place.